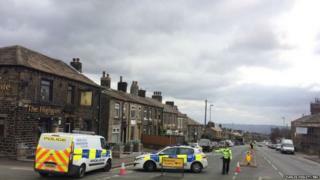 A man has been stabbed to death close to a main road in West Yorkshire. Police were called to New Hey Road, Huddersfield, at 02:21 GMT after reports that a man had received stab wounds. Emergency services found him "unresponsive" and he was taken to hospital but was pronounced dead. A murder inquiry is under way, and a large cordon has been placed in the area near to The Highgate pub, with the road closed off. Officers in forensic suits were at the scene, carrying out investigations along the road. Kirklees Council tweeted a warning earlier warning of the partial road closure.